I do like food, quite a lot, actually. But nothing can quite win me over like a perfectly sun-ripened tomato, picked at the prime point in the summer where, let's face it, you can just hand me a salt-shaker and call it a day. I don't need anything else to survive these brutally hot months. Unless it's a fresh baked almond croissant, but that's a story for another day. Another Deb-be-praised recipe, the one that so beautifully graces the cover of her recent cookbook, came to mind when I was charged with the task of preparing lunch for my lovely co-workers at Holstee. On a weekly rotation, we each take the time to put together a meal for our team, which is a fantastic way to commune together and share a basic and familial practice, one of the many reasons why this job rules New York, or pretty much any other place at all. Let me step quietly down from my soapbox of love now. I know what you're thinking: shortcakes? That aren't, well, sweet? And covered in sugared-up strawberries? Isn't that, well, wrong? In a word, yes, but in the very best way that something can be wrong. Though you expect this classic dessert to never change, the truth is, you can smash any fruit (which tomatoes in fact are) between these buttery biscuits and not go wrong. But add some scallions? And some whipped goat cheese? Oh heavens, there's no turning back. And, ta-da, you've made tomato salad! Now for the goat cheese "cream," all you really need to do is whip together some softened goat cheese and whole milk until the mixture is whipped and fluffy. 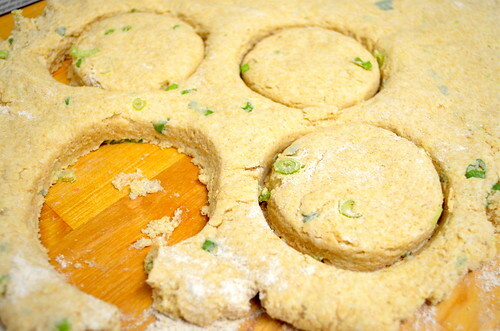 Add in another thinly chopped scallion to unite the flavors. 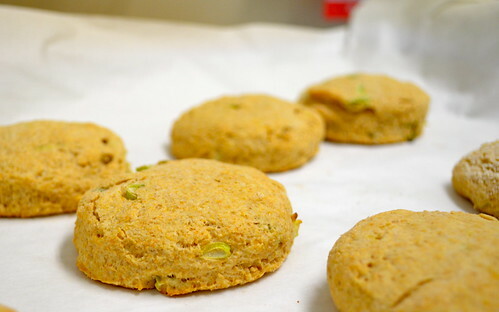 Now, making the biscuits themselves couldn't be easier: first, preheat your oven to 425 degrees. Line a baking sheet with parchment paper. 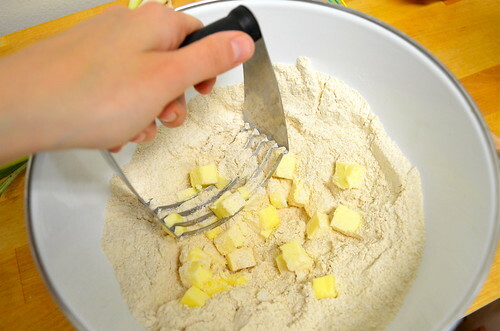 Whisk together the flour, baking powder and salt in the biggest bowl you've got. Using your fingers or a pastry cutter (or, if you're me, a little bit of both), cut in the butter. Since the butter is cold, this will feel like a bit of a futile process at first. Don't give up. It will, eventually, incorporate and your mixture will resemble a coarse meal. You're right on track. 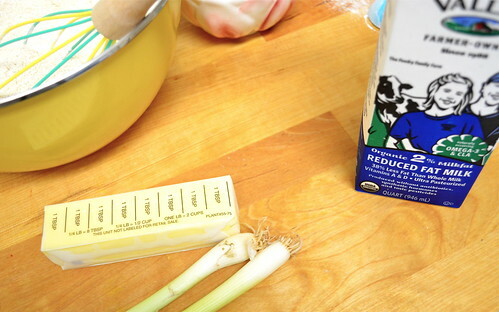 Stir in your scallion. Add your cup of milk and stir again. Sprinkle some more flour onto your countertops to prevent sticking, then pat your mixture out into about an inch thickness. If you have a round cookie cutter, great; otherwise, a simple glass will do to cut out some rounds, re-forming your scraps as necessary. Space the shortcakes about 2 inches apart and bake for about 15 minutes. Deb suggests rotating the pan for even baking, though I admit I forgot this step. Nonetheless, they came out quite perfect, I have to say. 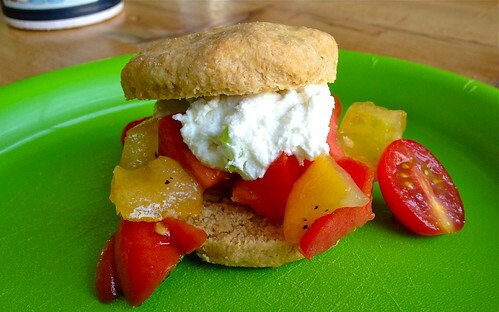 Split the warm biscuits and give each one a heaping spoonful of your tomato salad and a dollop (yes!) of your artfully whipped goat cheese. I found these really good, even surprisingly so. My skepticism, if you can call it that, can only be because of my love for tomatoes, feeling that any addition to them only overshadows their natural goodness. But trust me, I've never said no to anything in biscuit form. And now I may never return to sugared strawberries again.